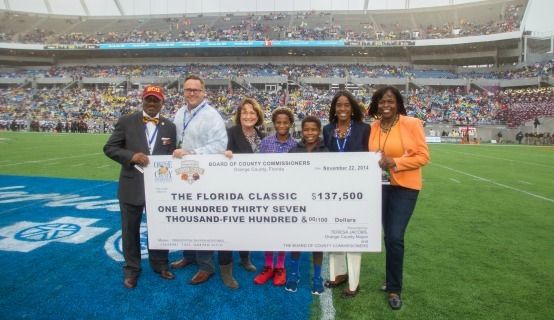 Orange County proudly welcomed thousands of roaring fans back to the newly- reconstructed Orlando Citrus Bowl for the annual Florida Blue Florida Classic on Saturday. The new Citrus Bowl hosted the nation’s largest HBCU rivalry between the Florida A&M University Rattlers and the Bethune-Cookman University Wildcats for the 69th time and the 35th time as part of the Florida Blue Florida Classic. The score ended with BCU taking the game 18 to 17. Since its first game in Orlando in 1997, a total of 875,089 fans have watched the Florida Classic in the Citrus Bowl stadium, with an average of 67,315 per year, according to the Florida Classic website. By comparison, the average attendance for the 17 years prior to game’s permanent move to Orlando was 40,341 – a total of 685,804. Joey Walters, director of the Florida Blue Florida Classic, said this game has generated significant revenue for the Central Florida community and local businesses since the game relocated to Orlando’s Citrus Bowl from the Tampa area, where the game had been played since 1978. The new Citrus Bowl was constructed in less than 10 months and replaced 90 percent of the stadium with brand new construction, creating an improved fan experience and utilizing the latest technology in the region’s largest stadium venue. There are now 65,000 seats available for fans and three large state-of-the-art video scoreboard displays. Orange County is a long-time supporter of the Citrus Bowl’s reconstruction. Last year, the BCC voted in favor of using Tourist Development Tax funds for the Citrus Bowl reconstruction as part of a $94.5 million venues package to transform Orange County into a Mecca of economic, cultural and sports opportunities to support the region’s increasingly diverse and creative population for generations to come. The Citrus Bowl will continue in its tradition of hosting signature events including the Buffalo Wild Wings Citrus Bowl and Russell Athletic Bowl. In addition to these events, the stadium will draw more high-profile events like NFL preseason match ups, spectacular concerts and more. At the dedication ceremony, Mayor Jacobs announced the Rebels and Seminoles will open the 2016 season at the Citrus Bowl as part of the first annual “Orlando Kickoff Game.” The neutral-site season opening game between Florida State University and the University of Mississippi will be played on Labor Day, Monday, Sept. 5, 2016, and will be televised nationally by ESPN.